For years I've been wanting a unique water fountain for our deck. I found many beautiful fountains but none that fit our budget. 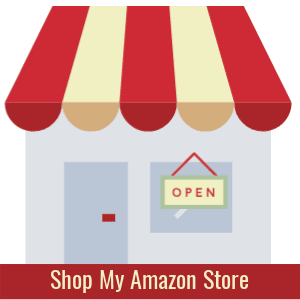 Every August, when they typically go on sale, I would frequent my local garden centers and home improvement retailers but the styles I liked would be picked over. One afternoon while relaxing on the deck I glanced over at the heap of plant pots we didn't use this summer. Stacked one on top of the other were a trio of pots that we've had for many years. While looking at the stacked configuration a light bulb went off in my head. What I saw wasn't a stack of plant pots but rather a Plant Pot Water Fountain. I spent a few days scratching my head to come up with a plan. I cannot tell a lie, we had several frustrating botched attempts with this project. Rocks that were too small and kept plugging the pump. A spray nozzle that overflowed onto the deck. Painting a large plastic base to catch the overflow but the paint peeled despite several coats of protective finish. We also had a chunk break off one of the pots while trying to make a hole in the bottom to accommodate the pump....ahem...with a hammer. Oh well, like they say, live and learn. At least by following this tutorial, you won't make the same mistakes we did. Eventually, we figured it out and today I'm sharing the step-by-steps so you too can build one. 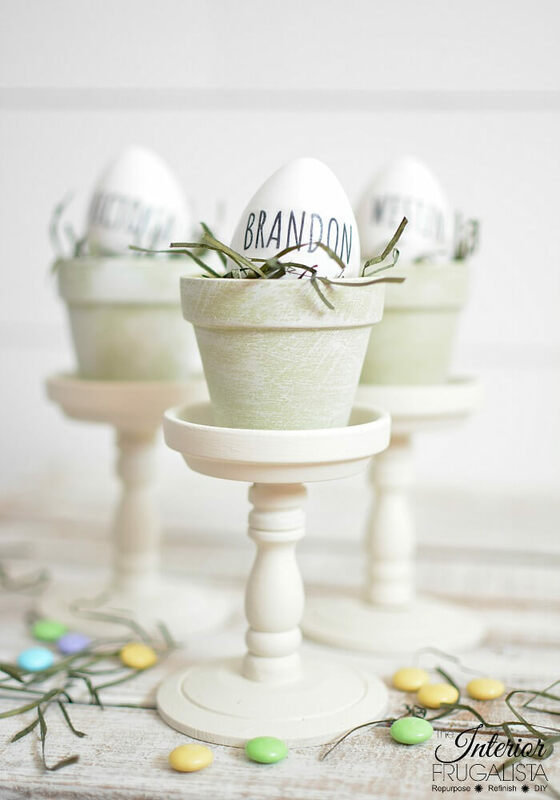 3 plant pots to create a tier in different sizes. You want to ensure they have center holes on the bottom that will accommodate the pump tubing or else you will have to drill the holes. NOTE: We used a 100 GPH Pond Pump. However, it's important that you purchase one that can lift the water vertically to just above the height of the top flower pot. I have been advised that it's a good rule of thumb to purchase one rated at least 6-inches higher than what you need. If it pumps the water too high, discharge the flow reducer valve to adjust the flow to where you want it. In order for the water to recirculate, you will have to seal the drainage hole in the bottom pot. We used a small tile but a piece of plastic would work too. Secure it in place with silicone, running it all around the tile as well to ensure a tight seal. Let it cure for at least 24 hours. 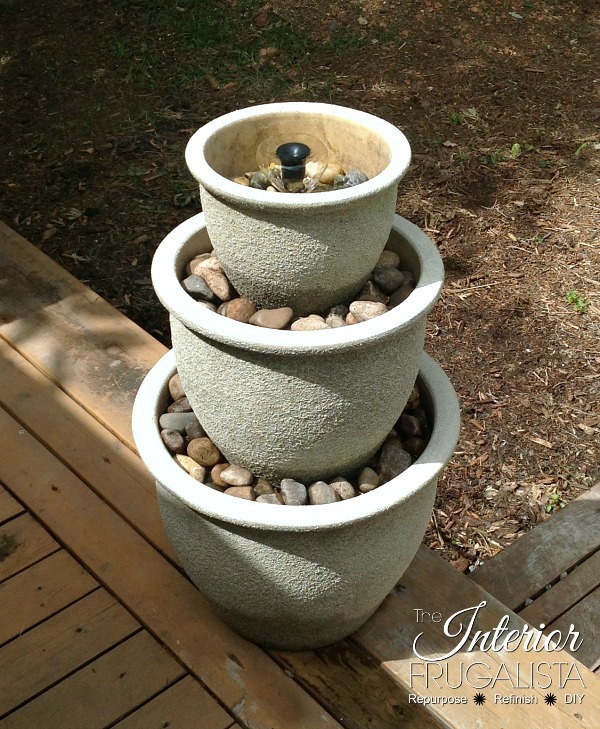 Place the pump on a sturdy base in the center of the bottom pot. Based on the type of pump you purchase and the size of the pots, you may be able to avoid this step. Attach the plastic extenders to the pump in order to raise it so the spray head is above the rim of the top pot. Now that you have the desired heights for each pot, remove the PVC pipe and notch out a groove in the bottom to accommodate the pump's electrical cord (see picture below). Set the plastic pipe so it rests on the bottom of the largest pot. This becomes your base for the next step. You'll notice the sturdy base we used to raise the pump to the desired height fits inside the PVC pipe. TIP: Make sure you cut the plastic tubing nice and straight so your pots sit level. 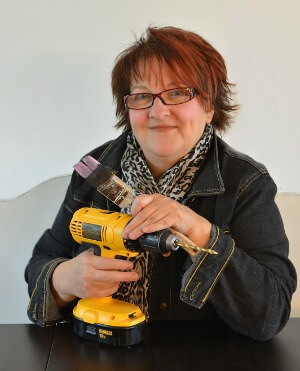 Drill a hole in the center of the medium terracotta pot using a ceramic drill bit. Make sure the hole you are drilling is big enough to accommodate the pump extenders. Set the largest terracotta base through the pump extender and let it rest on the top of the PVC pipe (see photo below). TIP: Unlike the photo below, it is better to place the terracotta saucer upside down to help conceal the lip. Insert PVC Pipe into the second pot. Add the next size terra cotta saucer. Remember to place it upside down (unlike shown in the picture below). Add the smallest pot on top of the terracotta base. Ensure your spray head is just above the rim of the top pot. You may need to add another pump extender to achieve the correct height. Insert the fountain spray head onto the last pump extender. Add river rock onto each saucer until the terra cotta saucers are completely concealed. Make sure you use a combination of large and small rocks. You want the large rocks to fill in the void between the saucer and the pot. The small rocks will help to conceal the saucer. Fill the bottom pot with water and plug it in. Don't be alarmed by the noise the pump makes as it's priming. 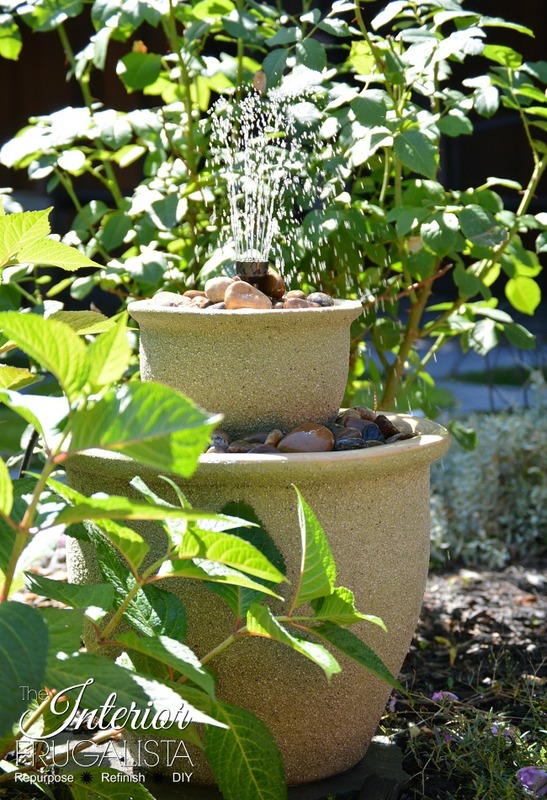 And there you have it, an inexpensive fountain for a deck, patio, or apartment balcony. 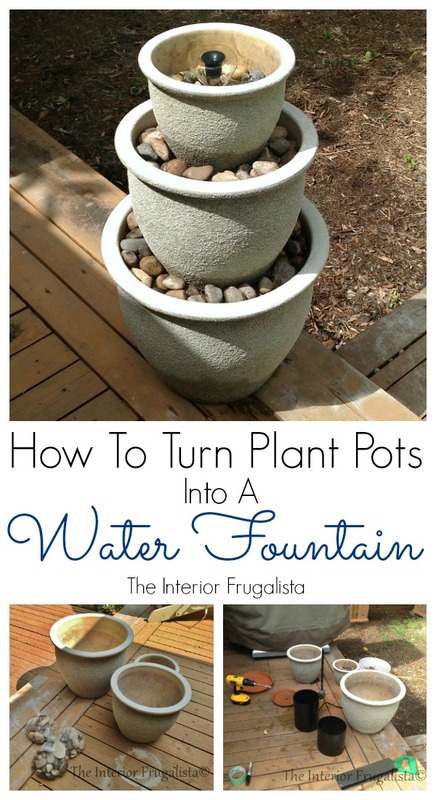 If you enjoyed my Plant Pots To Water Fountain tutorial, please share it with a friend and/or save it on Pinterest. If you are wanting the look of standing water in the pots cascading over the edges, you will need to silicone around the holes in the middle and top flower pots where your tubing is passed through. By doing this the water will be held in each pot and will flow over the sides. Again ensure the water does not spray over the edges. This style does not allow the fountain to be disassembled for winter storage. For this style, you will need a basin with a much larger circumference than the bottom flower pot so the spray can flow over the edges of the pots and land in the basin. In this design, your bottom pot will have a hole in it so the water recirculates from the basin rather than the bottom pot. NOTE: The basin must be deep enough to hold a sufficient water supply to keep the pump submerged in the base pot. You'll notice in the picture below that there are only two pots. Unfortunately, the middle pot developed a crack over the winter but did not survive. We also built a Solar Powered Plant Pot Fountain that can be made in less than 15 Minutes. If you want to get real fancy and know your way around power tools, we also build a beautiful Outdoor Water Wall that is perfect for a patio or deck. Are you protecting the pump from small stones and debris? Is that why you put it into the pot? I'm not sure I understand the question, Pam. The pump needs to be submerged in water and so the largest plant pot on the bottom houses the pump which must always be filled with water. The pump is sitting in the pvc pipe to hold it upright and to support the saucer that middle plant pot is set on. I hope this answered your question.